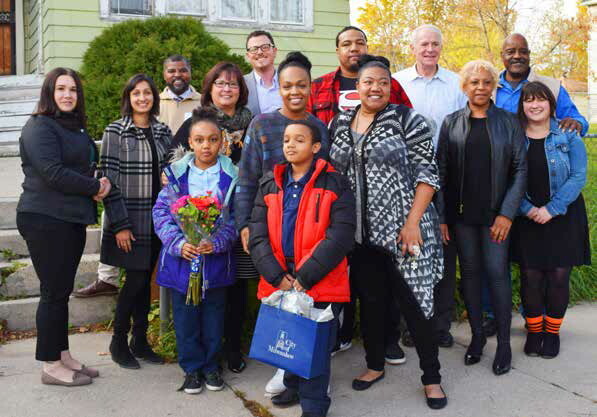 On October 31, 2018, new homeowners Monica and Rayford Jackson received congratulations and some small housewarming gifts from Mayor Tom Barrett and members of ACTS Housing following the couple’s purchase of a city-owned residence in the Harambee Neighborhood. From left to right: Ainsley Schley, ACTS; Priya Bhatia, ACTS; Deon Price, ACTS; daughter Mariel Jackson, Maria Santos, ACTS; Michael Gosman, ACTS; Monica Jackson, son Rayford Jackson, Jr., Rayford Jackson, Sr., Raegan Jackson, sister of Rayford; Mayor Barrett, Dorothy York, ACTS; Sam Smith, ACTS; and Rebecca Stoner, ACTS. The Jackson family has been working with ACTS’ Homebuyer Counselors for the past three years to get themselves ready to purchase. In brief remarks, Mayor Barrett said that lease-to-own programs such as ACTS Housing provide many advantages to residents, because the city does not have to continue paying to maintain residential property and homeowners contribute to the city budget through property taxes. Neighborhoods with higher rates of homeownership also tend to have a stronger sense of community and better local schools. The house across the street from the Jacksons’ house belongs to Rayford Jackson’s grandfather. The home Rayford Jackson bought went into foreclosure with the city, and the couple have been living on the first floor while leasing and beginning repairs. It will require an estimated $40,000 to be in compliance with city housing codes. The Jacksons said they intend to do the majority of the work themselves.